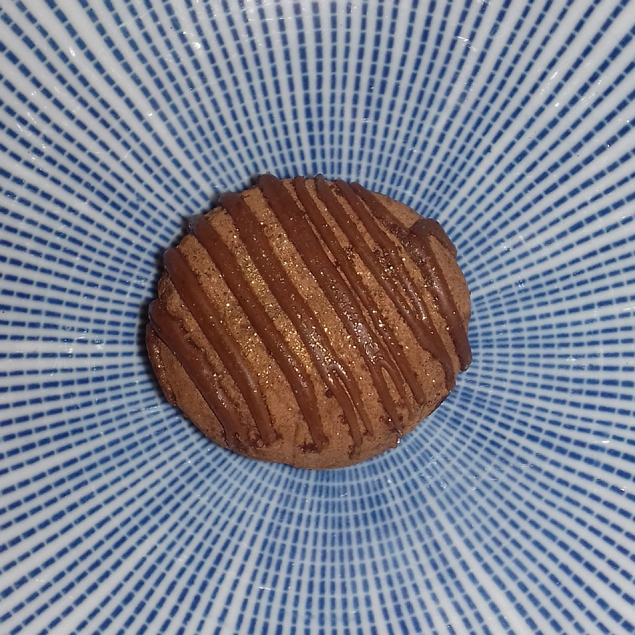 For me Ai No Mochi make the perfect Japanese sweets. Mochi are a traditional Japanese sweet dumpling, made from sweet rice flour and usually filled with red bean paste, which to my palate is kind of bland and not quite sweet enough. Ai No’s mochi are instead filled with more western ingredients; chocolate, caramel, strawberries and banoffee, to name but a few. Last year I had my first taste of their mochi when I was given some for my birthday. 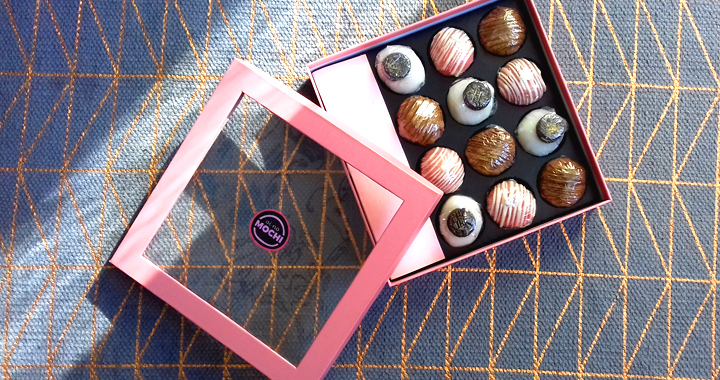 But this week I was given a box of 12 by my Mum and sister, containing three different flavours: chocolate ganache, cookies and cream and the newly introduced strawberry and white chocolate. Firstly, can we take a moment to admire how beautifully presented these mochi are. Dusted with gold, finished with edible pearls and drizzled with chocolate, they look stunning. The box is pale pink and looks classy. The only negative about their presentation is that in the box of 12, they send them in a box for 16 and blank out the missing four holes along the side. I work in retail so I guess this is because of the costs of bulk buying boxes in different sizes, however, to me it looks really sloppy for a premium product. I think even if they blanked the middle four holes out instead with some kind of nice patterned card it would look more symmetrical and less of an afterthought. The mochi have to be eaten within a few days of them arriving and need to be kept in the fridge. When you realise how tasty these are, you won’t have too much of a problem with this! Onto the flavours. The website is perhaps letdown a little with a lack of information. It lists the flavours, but no real explanation of what is inside and what makes up the flavours, which I think would help with making choices on what flavours to order. For example, the banoffee has real banana pieces in, as does the strawberry and white chocolate. I had tried the cookies and cream cheesecake flavour in the first box I had from Ai No Mochi, so I knew that these tasted amazing. 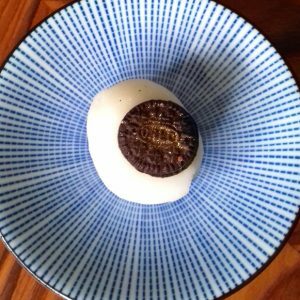 Filled with a cream mixed with crushed up Oreo, it is rich enough to be indulgent without being sickly. It is topped simply with a gold dusted mini Oreo biscuit. I am a real chocoholic, so I was pretty sure I would like the chocolate ganache. I was expecting it to be a really glossy filling like a ganache on a cake, but the filling was more like a creamy chocolate custard. This works really well with the gelatinous outer of the mochi. This was dusted in cocoa and gold dust and drizzled with chocolate. Again I would highly recommend this flavour. 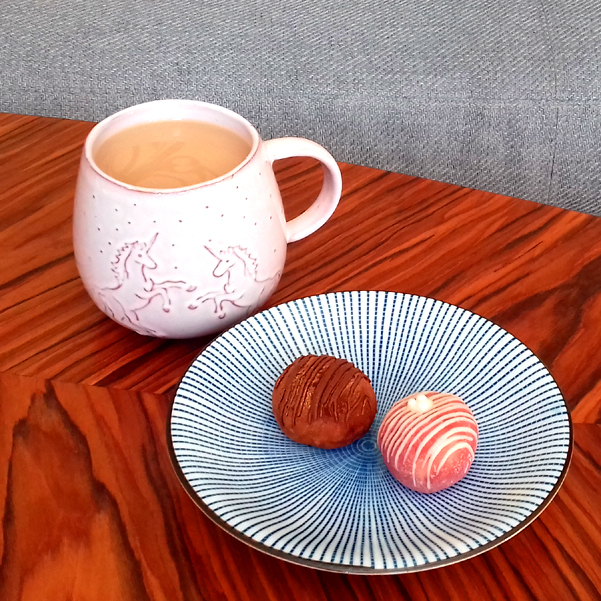 Finally, one of the newly added flavours to the Ai No Mochi collection, strawberry and white chocolate. 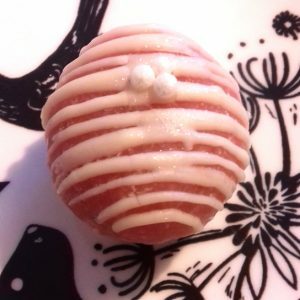 I’m always a little reluctant on fruit flavours, because so many of them are quite artificial, but this mochi has fresh strawberry added to its white chocolate cream filling, giving it a fresh burst of flavour. It is also the prettiest mochi I’ve ever seen, in pale pink, drizzled with white chocolate and finished with edible pearls. I’m not going to deny that Ai No Mochi are on the pricey side. They are definitely more of a luxurious gift or indulgent treat than something you would regularly buy yourself. However, if you love all things Japanese but find some of the traditional flavour options a bit acquired, these mochi are perfect. They are loads of flavours to choose from, including gluten free and vegan choices. They are definitely worth trying as an alternative sweet treat! 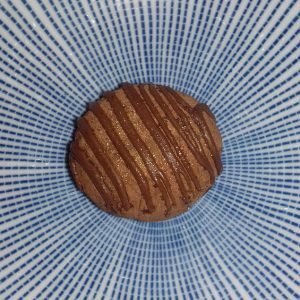 Posted in Reviews, Uncategorised and tagged Mochi, Review.